No. 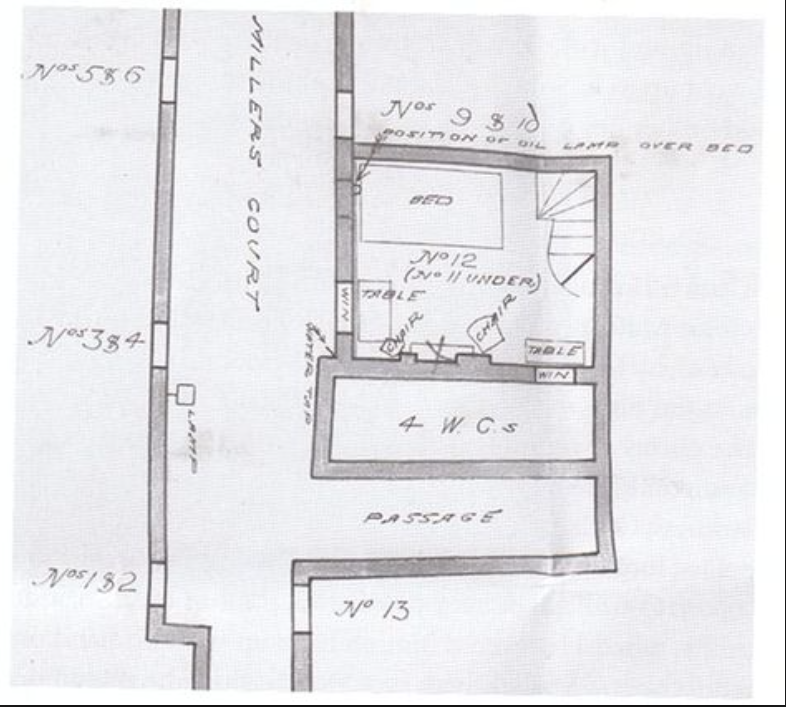 20 overlooked Dorset St.
What "outhouse"?, the Ronan sketch shows the W/C where it stood in 1909, but in 1888 the W/C was at the other end of Millers Court, next to units 5/6. 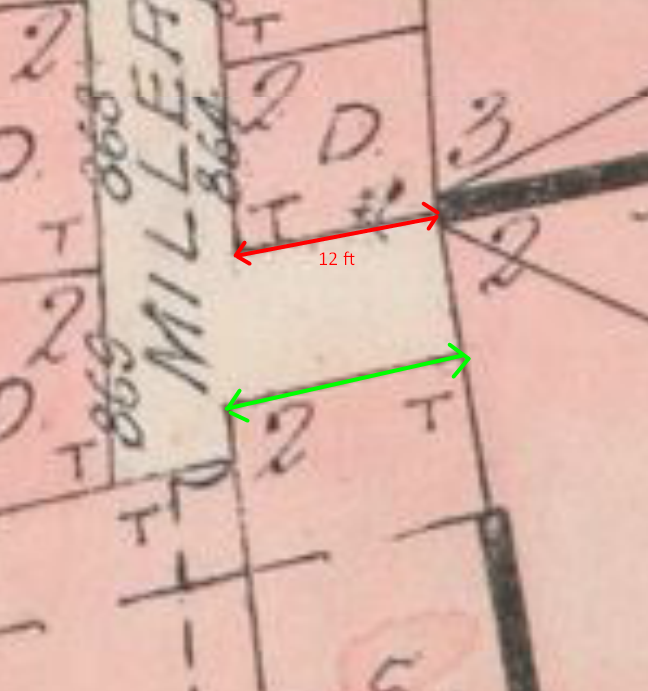 This is also where the 1890 Goad Plan shows them. 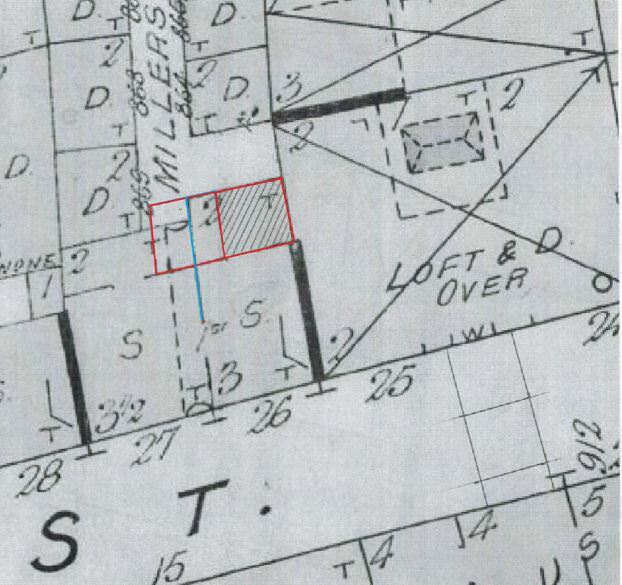 The "shed" was beneath room 20, and opened up onto Dorset St. This is where McCarthy kept his wheelbarrows. The attic over No.27, yes. Three of those six chimney's could belong to next door, No.25 Dorset St. The internal stairs would enter the next level inline with the partition for rm 13, that's all we can reasonably conclude. This is what Richard's 3D model indicated. Sort of off topic from #26 Dorset Street but still on the topic of doors in Miller's Court, I found this sketch I believe by PC Harry Woodley of H Division during the Kitty Roman/Ronan murder in 1909 in this blog http://www.babiafi.co.uk/2015/09/mid...oor-kitty.html. I noticed stairs at the back of the room which appear to lead up to #12 from #11. Does anyone know where the door at the bottom of the stairs would be? Or did the people living in the top apartments in all the court buildings pass through the neighbor below somehow? I can't quite figure out how they got to and from the top floor? I think you are right on. Thanks very much. Your work is very good. Keep it up! On Goad's, we can see #12 (marked red) and we can see #13 (marked green) as being longer than #12. From this, can we say that #13 was at least 15ft from door to chimney wall? I'm trying to get some detailed and accurate measurements of #13 and an experiment i did yesterday has thrown up some odd anomalies that I'm trying to figure out. For instance, it would seem that the BIG window of #13 is not central to the wall it's built into. The BIG window of #19 (above) is a mismatch and looks to be wider than the big window of #13. Also, the big window looks to be bigger than i thought in height - I thought it was about 5th high (sill to brick window arc) but now i make it to be 6ft). Also, this would mean that the ceiling height of #13 might have been closer to 10 ft high! - surely too high for a ceiling? This would make the small window height and the door to #13 to be 7ft high - again surely too high for the door? The Goad Plan of Dorset St. provides a dimension for the width of the street at 25 feet. This image shows two and a half squares (in pencil) across the width of the street. Each square is 10 feet on each side. 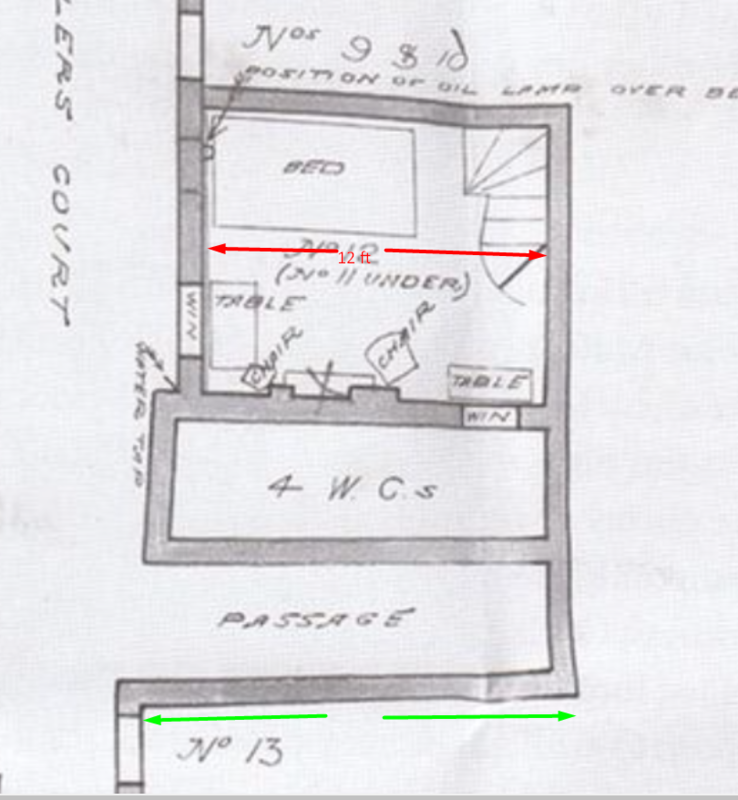 If we superimpose two of those squares (in red) over Kelly's room we see that the depth of her room was close to 10 feet, but the width was 1 1/2 of those squares, so close to 15 feet. We have press estimates of 12' x 12', and another at 15' x 12'. The Goads Plan seems to confirm the 15' dim, but tends to suggest the 12' estimate was closer to 10'.